Lunchepreneur is a free service that helps make long lasting relationships between business professionals by providing a venue to meet each other doing something they already do every day…eating lunch. Our mission is to create as many new professional business relationships as possible while at the same time maintaing highly accurate probability matching algorithm. We create lunch meetings with groups of 4 people who have been matched across 65 dimensions of professional compatibility ranging from industry to demeanor. 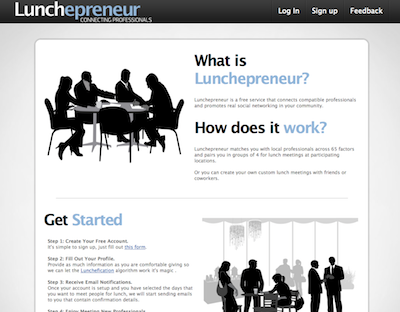 Lunchepreneur is a free service that matches business professionals in your area for lunch meetings. We help you build a true Social Network of connections that you have real life experience meeting with.